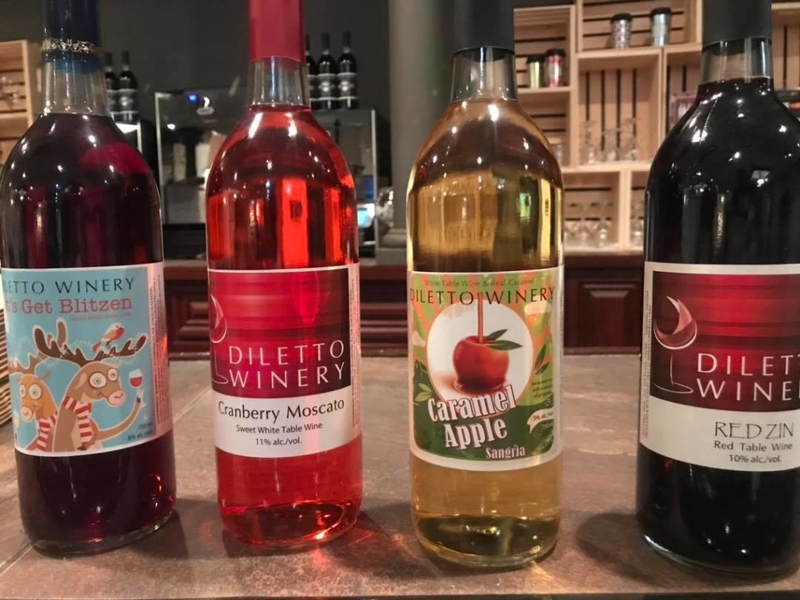 With a new and improved location, countless specialty wines and exciting events, Diletto Winery is definitely worth a visit while in Mahoning County. 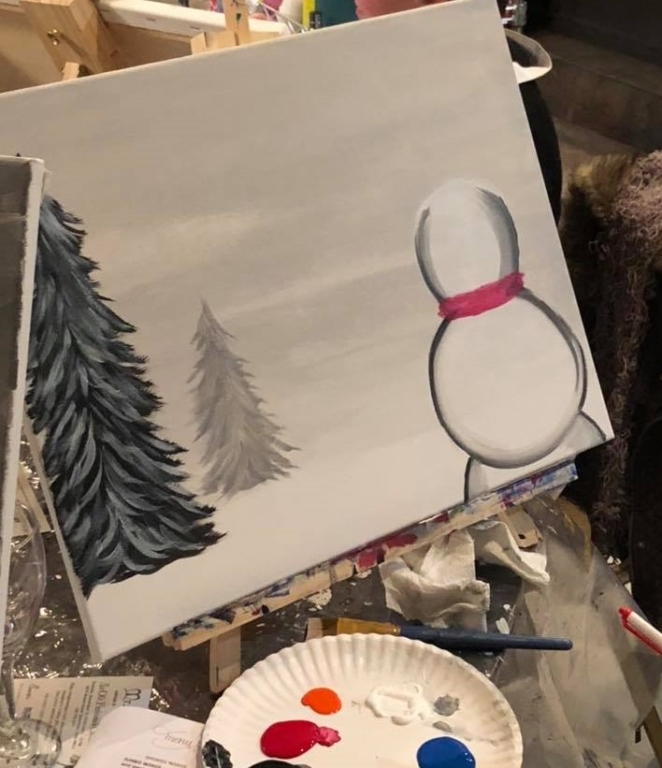 Today, we’re here to share the inside-scoop on Diletto’s big move to Boardman, along with more details about their varied wine selection, sip ‘n paints and February fun. Diletto bid adieu to blueberry donuts, and said hello to ballrooms as they moved from Canfield (across from White House Fruit Farm) to the old Antone’s Banquet Centre, 8578 Market St. in Boardman. The quaint winery packed up in September and has since transformed their new location into a bigger and better Diletto Winery. The challenge: how do you create a cozy and intimate winery vibe in a massive space like the former Antone’s? The answer: lots of comfy couches, warm lighting and (of course) good wine. At Diletto, you’ll find a wide variety of quality wines, sangrias and ciders- with the flavors constantly changing. In the summertime, try peach or Hawaiian sangria, or grab a glass of one of their specialty fruit wines. In the fall, watch for some of their award-winning wine ciders to return to the shelf, along with caramel apple sangria. And winter calls for even more unique flavors, wrapped in custom holiday-themed labels. In addition to a wide drink selection, Diletto also serves up some delicious bites (and full meals, for events). On their regular menu you’ll find snacks like cheese plates, flatbread pizzas and sandwiches. And on Fridays and Saturdays, jumbo wings are dry rubbed, smoked in-house and sold for just 79 cents each. Participate in one of Diletto’s upcoming guided painting sessions! A preview of the paintings can be found on Diletto’s event calendar. Tickets are $40 and can be purchased here. This Valentine’s Day, you can treat your loved one to a special four-course dinner at Diletto! Tickets are just $35 per person and include a dinner buffet, glass of wine, romantic live music and roses for the ladies. Play along as the suspect of a murder during a 3 or 4-course meal. Visitors are assigned specific characters with “roles” to act out and, throughout the night, you must guess who committed the crime. Tickets are $49 and include a glass of wine, food and fun entertainment. 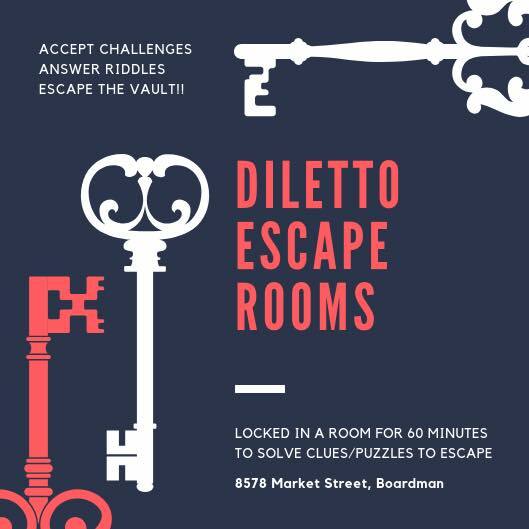 Have an exciting (and possibly frustrating) night out with friends or family by participating in Diletto’s themed escape room! Whether you’re breaking out of prison or robbing a bank, your mission remains the same: use clues to escape the room before the time runs out. Tickets are $28 and can be reserved here. All of Diletto’s events, descriptions and links for tickets can be found on their event calendar. Whether you’re looking for a great glass of wine or fun night out, Diletto Winery has something for everyone. For more information on Diletto and other local wineries, visit our Facebook page or take a look at the Mahoning County Convention & Visitors Bureau website!